Today's federal court decision reveals that when Obama came to Standing Rock in the summer of 2014, the Dakota Access pipeline was obtaining permits for Standing Rock. WASHINGTON -- Today's intervention by President Obama is misleading. Obama is only asking Dakota Access pipeline to voluntarily halt construction around the lake, while permits are re-evaluated. Further, this only applies to the area around the lake. The Obama administration states, "we request that the pipeline company voluntarily pause all construction activity within 20 miles east or west of Lake Oahe." Today's response from the federal court reveals what Censored News exposed earlier. 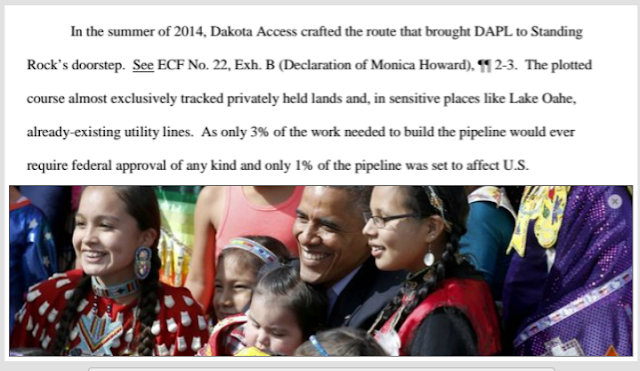 When Obama came to Standing Rock in the summer of 2014, and was photographed holding babies, Dakota Access pipeline was already obtaining permits for Standing Rock. The following excerpt is from the denial of Standing Rock's case by U.S. District Judge James Boasberg. “The Army will not authorize constructing the Dakota Access pipeline on Corps land bordering or under Lake Oahe until it can determine whether it will need to reconsider any of its previous decisions regarding the Lake Oahe site under the National Environmental Policy Act (NEPA) or other federal laws. Therefore, construction of the pipeline on Army Corps land bordering or under Lake Oahe will not go forward at this time. Thanks to all who have signed petitions, called their representatives in Congress and written to the White House to shame President Obama for his unconscionable response to the Malaysian reporter who asked about his viewpoint on this crisis. Haven't done that yet?? Please DO SO IMMEDIATELY. Keep the pressure on. The First Nations people of the U.S, have been ravaged, silenced, abused and invisible for long enough. This is seemingly positive news. I am curious how the Standing Rock tribal chairman and others there see this statement from the Feds. Is the Missouri protected by this temporary pause? HI Brenda.... great reports.... have been public sharing on facebook and emailing your links!... tried to facebook post this article 4 times & did not post... also i guess you know that- http://bsnorrell.blogspot.com/2016/09/us-departments-will-not-allow-pipeline.html --is different than article title. Have continued to direct gente to your site. THANKS FOR YOUR GREAT WORK!! You article is misleading. Work on the pipeline is halted on Corps of Engineer property, period! Dakota Access is not allowed to proceed at this time until further notice. The company was asked to voluntarily suspend work on the remaining stretch of pipeline which is on private property over which the Corps has no jurisdiction! Politicians use tricky words and phrases. Is it wrong to poison people or not? Is it wrong to poison our water supply or not? Is it ok to poison some people in order to make money or make some people rich or not? Is developing Green energy going to poison us or not ?